You can feel the warm tropical breezes the moment your look at this sunlit flower arrangement! Embracing the textures and shapes that can only be found when island bound, this stunning bouquet brings together red ginger, yellow protea, Birds of Paradise varieties, peach hypericum berries, yellow solidago, and an assortment of tropical leaves to create a truly stunning display. Presented in a sleek graphite oval container to give it a sophisticated and modern look, this arrangement is an unforgettable congratulations, happy birthday, or thinking of you gift. 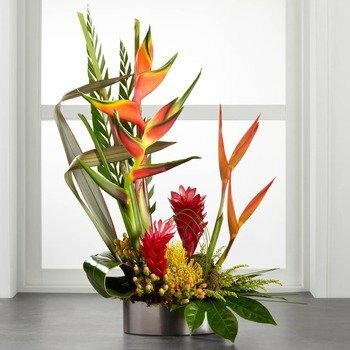 There is a one day lead time on tropical arrangements delivered by local florists. Orders submitted before 1:00 PM Eastern Time Monday - Friday can be delivered the next business day. Delivery is not available on Sundays. * Great and beautiful gifts available. * Excellent job. Many thanks!